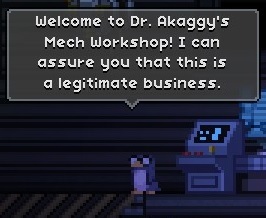 Dr. Akaggy is a penguin scientist who has set up shop at the the Outpost. Her specialty is in Mech construction, and will handsomely reward those who help her in testing her newest models. Assuming they survive, of course. Dr. Akaggy's workshop opens up once the player has completed the "Become Space-worthy" quest, finally allowing proper space travel. This also gives the player access to the Mech Assembly Station and Mech Part Crafting Table, though they can't do anything with them until they get Mech parts. Completing Dr. Akaggy's first side-quest grants them the parts to do so, and the Dr. offers more quests to increase the player's Mech capabilities. She is also the pilot of the Shockhopper Mk I mech battled at the Penguin Weaponry Testing Site. Beating her unlocks a new Mech Blueprint, and also opens up Biggy's Reputable Weaponry across the hall from her workshop. Dr. Akaggy may be named after Dr. Naoko Akagi or Dr. Ritsuko Akagifrom the anime Neon Genesis Evangelion. This page was last modified on 23 May 2018, at 16:10.